An overview of the British population has revealed it is at its highest ever level, with experts claiming it will rise from 65 to 77 million in the next 22 years, largely due to immigration. The data, revealed by the Office for National Statistics (ONS), showed a total of 588,000 people entered the UK in 2016, yet just 339,000 left. Net migration has added an average of 250,000 to the UK’s population each year since 2004. 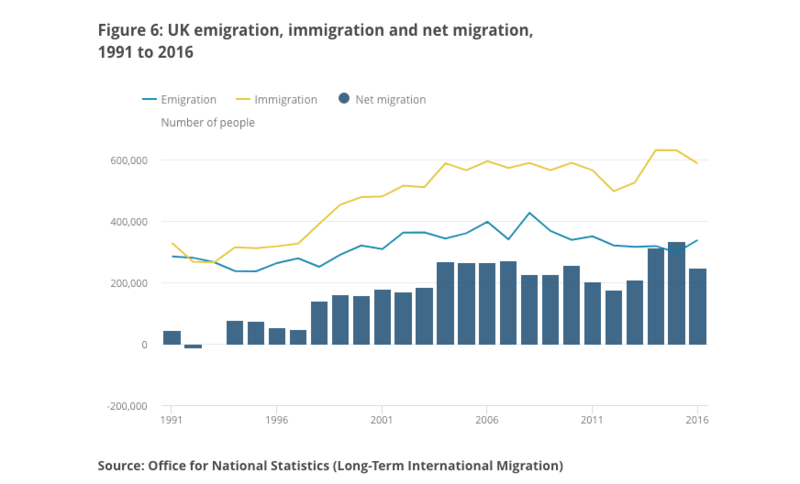 Immigration has been higher than emigration since the 1990s, when Tony Blair’s Labour came to power, with net migration — the difference immigration between and emigration — peaking in 2014. However, migration also has indirect effects, among them the comparatively high numbers of children born to immigrant mothers. As separate ONS figures released earlier this week show, 28 per cent of births in England and Wales in 2016 were to mothers born abroad. Migration Watch UK claims that when these indirect effects of migration are factored in, the population will surge to almost 77 million (18.4 per cent) by 2039 – rather than the 74 million projected by the ONS. Lord Green of Deddington, Chairman of the think tank, blasted: “Our country is getting ever more overcrowded. The data also demonstrates how the population of the UK is getting older, with 18 per cent aged 65 and over and 2.4 per cent aged 85 and over. The age of Londoners, however, is significantly younger and is not set to get much older. Areas in the South – including Rother in East Sussex, East Devon, and Dorset – have the highest proportions of over-85s, while London Boroughs such as Tower Hamlets, Islington, and Hackney are consistently among the youngest.